Chobani Blackcurrent and the limited batch Chobani Kiwifruit, are now available at Woolworths supermarkets across Australia. 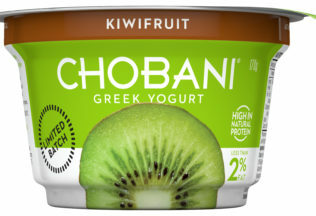 Chobani says it continues to refresh its range to keep Australian taste buds “on its toes” and to deliver on requests for particular flavours. “Our fans are always eager to discover what new Chobani flavours will come out next, so it’s important that we keep our range fresh and innovative,” said Peter Meek, Managing Director of Chobani Australia. “The ability to launch limited batch flavours as an extension from our core range, allows us to test and learn what consumers want and deliver to popular fan flavours request,” he said. Chobani was established in New York in 2007 by Hamdi Ulukaya after he brought a plant which was being closed by Kraft Foods. Chobani yoghurt has been sold in Australian since 2012. The Buderim Ginger Pride Rally is coming to Melbourne.